White logo on blue (even if the original logo is multicolored). This type has been used until now by Israel Police, Israel Railways, Haifa Port [Authority], National Insurance Institute. Color logo on white. This type has been used by Israel Ports and Railways Authority, Airports Authority, Civil Guard (police volunteers), Department of Public Works. White logo on a blue field. The flag is 2:3 with the emblem about a third of the flag length, situated in the upper part of the flag, making space for the inscription below. Image of the logo here at the Israel Antiquities Authority website. The Antiquities Authority is responsible for all ancient sites in Israel. Its flag is blue with a white logo as can be seen in these photographs. There was a programme on British television on 27 December 2005 called "Digging for Jesus", a (not unreasonable but rather superficial) look at the archaeological evidence for the places and events described in the New Testament. One of the places visited was Megiddo Prison, where the remains have been discovered of what appears to be a very early Christian church. A photo of the excavation showed flags flying on separate poles. 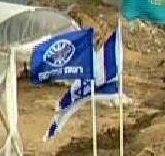 It seems that one nearest the camera is the flag of the Israel Antiquities which are rather different from the previous photos. The flag used by the Ministry of the Environment shows the Ministry's emblem - green and orange leaves shaking hands with the Ministry's name below in Hebrew, Arab and English in black lettering - as can be seen in these photographs I took. Unfortunately the Ministerial website still uses its previous logo so I cannot make a GIF. While visiting the Achziv National Park, I noticed some plastic flags, photographed here. Yarqon River Authority, started to hoist water quality flags in order to indicate the local sailing clubs abote the pollution rate of the River. The Yarqon River fountains are at Afeq, near Rosh HaAyin. From there, it flow westbound and its estuary is at the north part of Tel-Aviv. There are quite a few sailing clubs situated in its lower part. The lack of adequate sewage in the area made it an easy way to get rid of drains and it became highly polluted with toxic materials. The Yarqon River Authority was established in 1988 in order to clean and restore the river. Its upper part is already cleaned and restored, however its middle part is still polluted, and during rainy days, the pollution also reached the lower part. According to an item at Yarqon River Authority web site from 5 May 2008, the authority started to hoist flags that indicate the rate of pollution at the lower part. Red flag - water quality is not suitable for sailing.